Try and engineer a bumper jackpot by firing up the Gem Machine, an unusual 5 reel, scatter pays video slot from Bally. The set up here is a little unusual. Instead of forming winning combinations, each gemstone symbol that lands delivers an instant win. There are also free spins and jackpot prizes on offer. Play on all devices from between 25p and £150 per spin. If you’re lucky enough to land more than 1 gemstone on the same spin, all the awards are added together for your overall prize. This could result in payouts of 15,000 times your total bet (by filling the reels with amber gems). As well as gemstones, there’s also a Free Spins symbol. Each 1 of these comes with the number 1, 3 or 5 attached which is the number of free spins you’ll win in the Free Spins Bonus feature. Land 1 of these symbols during the bonus round and you’ll re-trigger more free spins. Above the reels you’ll see Mini, Minor, Major, Mega or Grand Jackpot prizes. These are triggered by landing the associated gemstone on the reels below. These offer instant prizes of some 20, 40, 200, 400 or even 1,000 times your total bet. We’ve found Bally video slots to be really hit and miss both in terms of design and gameplay. Gem Machine is in the hit category on both scores. The simple design works well here and the unusual gameplay delivers something different. The scatter style pays can deliver some decent action. 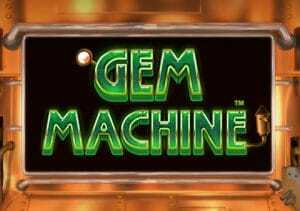 Add the free spins and jackpots into the mix and we’re happy to fire up the Gem Machine. Get lucky and you could engineer some very decent action. I would also recommend you try Monopoly Millionaire which is 1 of Bally’s better releases as it can make you an instant millionaire!